ON THE first day of Christmas my PMs gave to me: one onion munching, two backs a-stabbing and an offshore account overseas. What a tumultuous dog's breakfast of a year! Thank the Jolly Fat Man because a functional government would have been about as useful as a stocking full of coal for a budding political mickey-taker such as me. 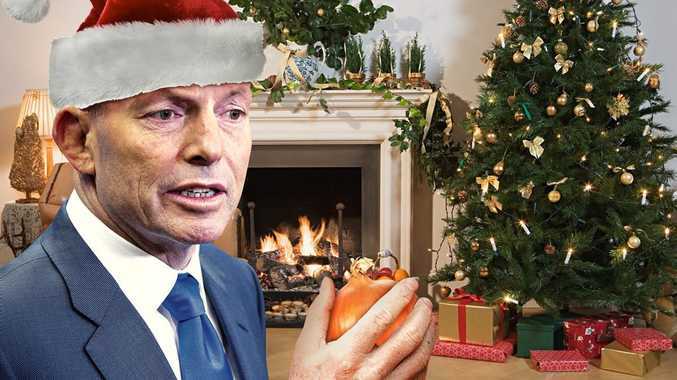 Looking back on this year's generous gifts moistens the peepers more than a freshly chomped aromatic bulb, which Tony Abbott assured us in August was definitely not a super weird thing to do. Take the whole dames and knights fiasco, for example. 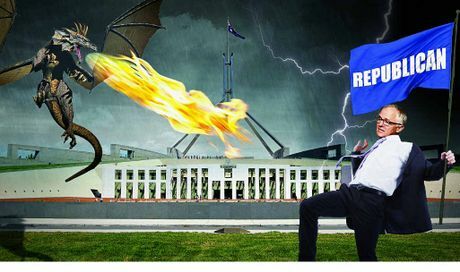 Turnbull gets rid of knights, dragon invasion soon follows. Imagine our ousted captain's befuddlement when Australia winced en masse as he revived an archaic and decidedly monarchic institution, only to dole it out to the Queen's significant other. The writing was on the wall and it read: seriously out of touch. Well, the old saying "persistence pays off" is true if you're Malcolm Turnbull, and so do offshore accounts. Years of carefully scoping out an opportunity and basically lingering in the shadows like an impeccably garbed Jack the Ripper while Tony Abbott made himself unelectable have proven a sure-fire strategy for success. Some of the shine has come off old Blue Eyes, what with allowing more than a third of the country's biggest companies to pay zero tax and all, but who really gives two hoots. Have you seen who he is up against? No amount of government silence on Nauru human rights abuses, tax dodging revelations or chopper flights to la-di-dah soirees is helping Opposition Leader Bill Shorten at the moment. This whole unions royal commission debacle has put the stink on Labor's top man, whereas his deputy Albanese is a bit of a hit with the inner-city whippersnapping crowd and regularly spins the sick-as beats in bars under the moniker DJ Albo. That is 100% true, look it up. DJ Albo tears up the decks: Anthony Albanese talks about his moonlighting career as a DJ on the Channel 7's Today show. Bit of a pinko, though. The past year also gave us a climate change plan we can truly be proud of, having trumped both Kazakhstan and Saudi Arabia to rank 56th out of 58 of the world's biggest emitters. Take that, you two giant oil producers! Pipped at the post. It also gave us Big Mal Brough, who may or may not have had an older sister who should maybe have told him it was rude to read other people's diaries. His answers over the whole Peter Slipper farce have been about as easy to follow as a Stephen Hawking tome scrawled in Swahili by someone with a GP's handwriting skills. And lastly, it seems fat cats really do land on their feet. Joe Hockey delivered an absolute stinker of a budget, told poor people they could afford more stuff if they went out and got rich, and resigned as soon as it became apparent he would have to sit a bit further back in parliament, meaning an early by-election for his seat was needed. Now the million-dollar man has raked in a cushy tenure as our ambassador to the United States, pretty much the best overseas post going around. Please remember to thoroughly scorch any onions bound for the dinner table and enjoy the silly season. It should last another decade or so. Tony Abbott: Trump's policies "reasonable enough"